A hiker fell near the top of Bishop Peak Thursday evening and was airlifted off the mountain. Fire officials say the man suffered severe injuries. San Luis Obispo and Cal Fire crews began hiking up the mountain around 5:30 p.m. A CHP helicopter provided light from above and was later joined by a Santa Barbara County chopper. 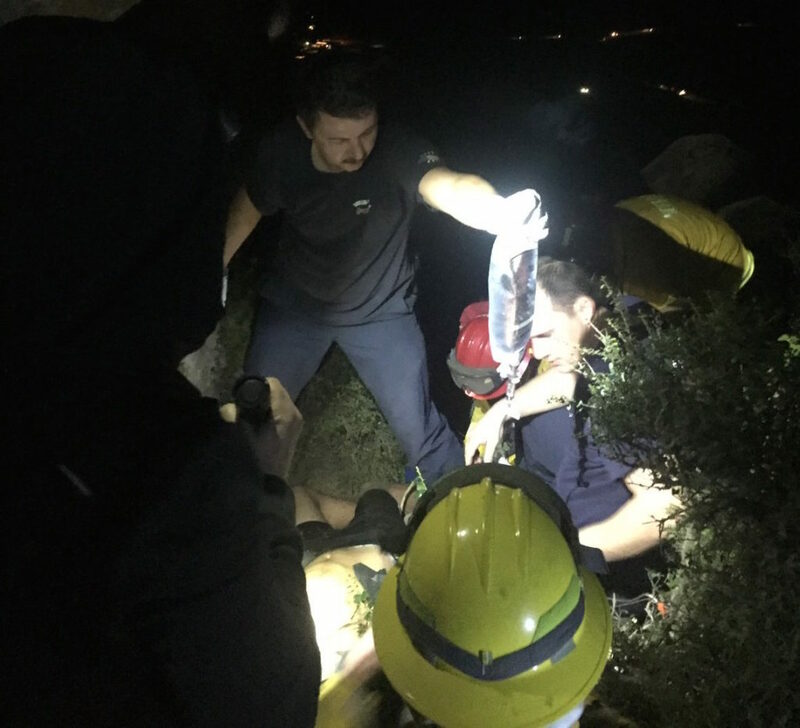 Rescue crews on the ground attended to the injured man before the Santa Barbara County helicopter hoisted him off the mountain and transported him to the hospital. A total of six fire engines took part in the rescue. It is unclear what caused the man to fall. Fire officials have not released the identity of the injured hiker, nor have they elaborated on his injuries. KSBY reports the injured hiker fell about 20 to 30 feet from the top of Bishop Peak. The man is believed to be in his late teens or early 20s. I hike Bishop’s Peak from time to time. I could totally see how this could happen. All it takes is some rain, some drought, some loose gravel, a misstep, etc. You know, we send BILLIONS of dollars each year for people who abuse their bodies with booze, drugs, twinkies, and laziness to have emergency medical care. Why NOT spend the money to rescue a teenager doing some healthy activity? I am sick of paying for a 65 year old to have their 3rd angiogram and 2nd bypass surgery when they are going to turn around and keep smoking and keep eating biscuits and gravy while riding a lazy cart? As for the manpower, these men are getting paid whether or not they respond to their emergency. Rugged terrain rescues don’t happen often here, so why not use one that is already happening as a “teachable” moment? I find that a good use of their time at work, and it helps them become more experienced at the non traditional rescue. That terrain is rough as it is, let alone carrying gear and necessities up a mountain trail. Geez. I know it is an oddity to be human these days….but I hope the poor guy recovers fully. You all would probably feel different if was yourself or a loved one. A total of six fire engines took part in the rescue. “Justification.” How else can (for example) the SLPFD justify that ridiculous Truck #1 — the one with the silly tiller driver in the back. I suspect some also booked a bit of OT. Every time I see that Truck #1 I mentally flip it the middle finger. What a prime example of waste by our city. Have you ever tried to carry someone down a mountain on a stretcher? It can easily require 25 people or more. They needed to prepared to so this if necessary. Any and all incidents are important to the training and education of those who are willing to put their lives on the line for us. This is typically a labor intensive incident. Engines typically have 2- or 3-person staffing. They need the bodies to move the patient to a point where he could be treated, immobilized, and prepared for helicopter transport.